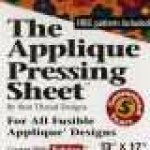 The applique pressing sheet is a multi-purpose crafting sheet. It is reusable, double sided and made from ultra high temperature glass, coated with non-stick Polylon . This transparent sheet allows you to see your pattern for placement of appliques. 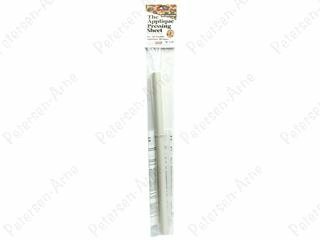 This craft sheet can be used with hot glue guns, wax designs, fusible web, paper piecing, fabric stiffener, glue projects, rubber stamps, embossing, paint and even in the oven to bake shrink-art, clay, salt dough, etc. Guaranteed for 5 years. Applique 13" x 17" Rolled Package. Instructions for its multi-uses and a free applique pattern are included.